On this beautiful picture above you can see the magnetic field of the Earth. To me, the earth looks like a Spider. I am not surprised that the oldest mythologies about the origins of the universe talk about the Spider Grandmother who created all. 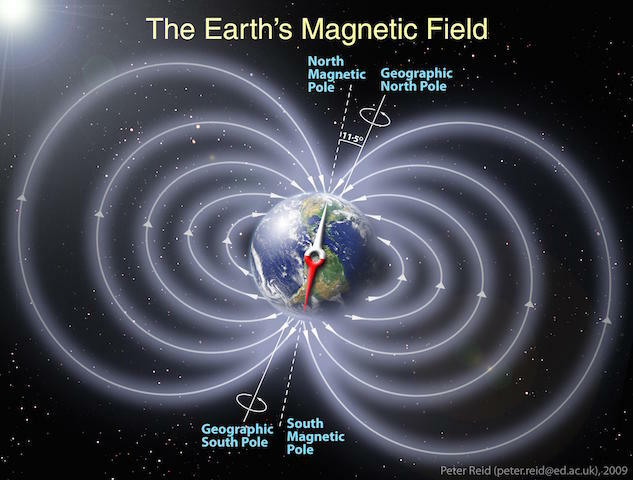 So what exactly is the magnetic field of the earth? The earth its core is composed out of iron and nickel. These function as a magnet. The Earth’s magnetic North Pole is in North Canada and its magnetic South pole is in Antarctica. This field enables you to use GPS on your cellphone (and find your parked car back in foreign cities). This magnetic field is generated by the flow of liquids in the earth, and changes due to solar wind. In 1996, Stanley Krippner of Saybrook University published an article about the influences of the changes in the magnetic field of the earth on our dreams: “Dreams and Distance Target Material”. In his article he states that “there is more telepathic dreaming during decreased geometric activity”. But also finds that “visual apparitional experiences occur more frequently on days with enhanced geometrical activity”. In a more recent stud, in 2009, Darren Lipnicki, a psychologist formerly at the Center for Space Medicine in Berlin, Germany compared his dream content with the Earth’s magnetic field and found that during periods of low activity his dream content was what he called “bizarre”. In a seven-year period he collected 2,387 dreams and scaled them on bizarreness on a five point scale. Then he compared it with the K-index, a scale used to characterize the magnitude of geomagnetic storms. It tells you all you need to know about the history of the Earth, the formation of the magnetic field and magnetism. Do you like this post? Don’t forget to share it with your friends. and grab yourself a free ebook about mutual dreaming.